My youngest turned four last week, and because he has a big brother, he chose a Star Wars theme for his birthday celebration. How do you make Darth Maul and Lord Sidious cute?! I know. I'm a girl. But as a mom, there are just some story characters and movie elements that I'm just not in love with. So in order to have a party erring on the "light side," I decided on some simple decorations and fun preschool activities. 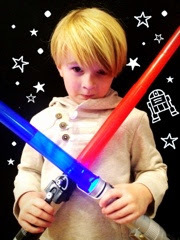 First, I took a picture of my little guy in his best Jedi pose and did some editing on my phone for his email invitations. Honestly, it was faster and the easiest way for me to be in contact with other parents for RSVPs and any changes in plans. Plus, it was free! For a preschool lunch visit during the week, I bought pre-made brownies, slapped some thematic pieces on top and made my son and his tummy perfectly happy (without all the fuss). I also put together a little party favor for each of his classmates for less than $1.00 a piece. A starry bouncy ball and two "light saber" glow sticks in a little black gift pouch. The cake was just a boxed chocolate mix baked in two round pans then iced with a dark gray tinted frosting. 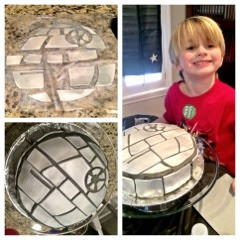 My son thought it would be cool to have a "Death Star" cake, so I browsed online for ideas and contemplated the simplest way to do this for a non-professional cake decorator (me). I bought pre-made white fondant and rolled it out, cutting out shapes resembling the main elements of the ship. Then I sprayed it with an edible silver color spray (shortcut), and stuck them into place on the frosted cake! 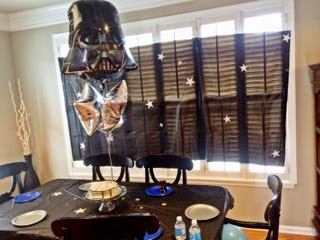 I wanted the party decorations to use the Lego Star Wars characters because they seemed more age appropriate, but I could not find plates and napkins for a reasonable price. I ended up printing out some images to set out and then kept with a blue, silver, black color scheme. My older two kids were wonderful helping with cutting out paper stars and using some glow-in-the-dark stars for table decor. We also looked around the house for Star Wars toys we already had to display. The boys were proud to show off some Lego sets and figures they've collected. The biggest part of this celebration was planning the activities. It's usually cold in January, and we've had several stretches of rainy weather. So having an inside party requires some creative preparation! The pool noodle light sabers were a big hit. We cut red (Darth Vader), blue (Luke Skywalker), and green (Yoda) pool noodles in half. Then I wrapped the ends in black and silver duct tape, using blue round price stickers for buttons. When the kids arrived, we let them decorate the light sabers with star stickers and letters for their names. With their new (and safe) weapons, they defended the earth from asteroids. The object was to keep some grey balloons from touching the ground with the light sabers. What's more preschool than playdough, right? We just used blue, black, and white colors to coordinate with the party. Then we let them mix them and cut out stars with cookie cutters. We drew storm trooper faces on helium-inflated white balloons with Sharpies and let the kids shoot at their enemy targets with Nerf guns. My older son was more than happy to help with this activity. For this busy activity, I printed out images I found online and had them laminated to be waterproof. Then I covered the bottom of a plastic container with aluminum foil and filled it with water to represent the carbonite that poor Hans Solo is frozen in. It took about 12 hours to harden, and I froze four blocks so everyone would have a chance to free the Star Wars hero. The kids took turns pouring salt and warm water over the ice, then used spoons to chip away the ice, ultimately rescuing the prisoner! It's Another Mom Season Summer Plan! Are you underestimating your mom super powers? Copyright Dani Byham. Powered by Blogger.